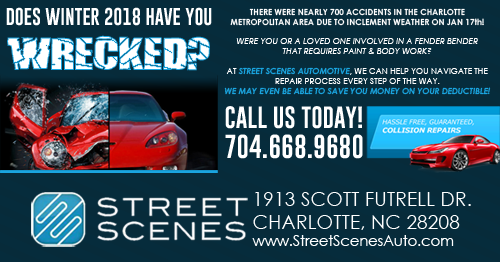 There were nearly 700 accidents in the Charlotte Metro area due to inclement weather on January 17th alone. Were you or a loved one in a fender bender that requires paint and body work? At Street Scenes we will help you navigate the repair process every step of the way, and we can even try to save a portion of your deductible. You can text me some pictures to 704 668 9680 and I can give you a ballpark estimate.